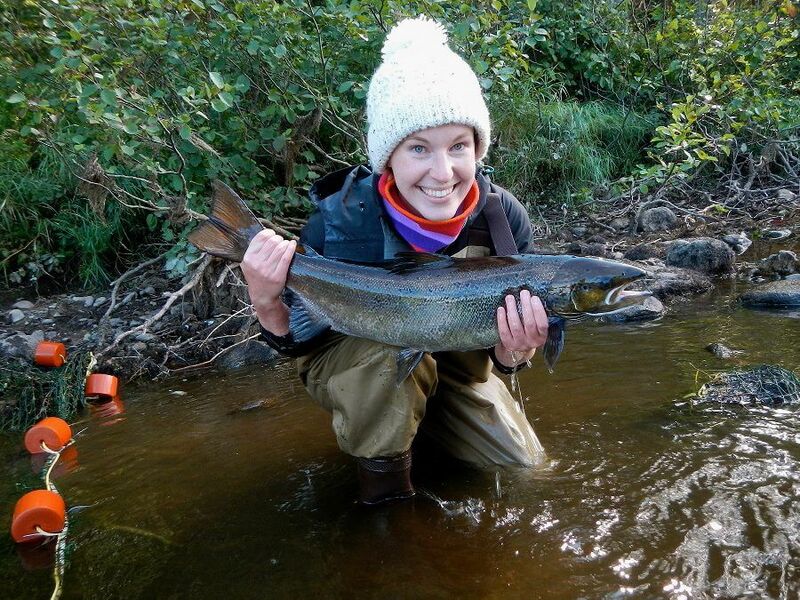 Every autumn, hundreds upon thousands of adult Atlantic salmon make their way up creeks, brooks, and streams all over New Brunswick to spawn. By the light of the moon, metre-long females dig gravel nests known as ‘redds’. A single female can lay up to 15000 eggs that remain buried in the gravel over winter, slowly developing into tiny, bug-eyed fish babies. It’s well known that winter in Canada is long and hard, and underwater it isn’t any different. A chill creeps through the water and slows their tiny metabolic rates to a crawl. Eventually, the ice breaks up and scours the gravel riverbed – some of the eggs end up crushed under boulders or scraped up on shore, while others end up in pockets of low oxygen and suffocate. In the best case scenarios, about 40% survive. The eggs hatch into clumsy baby fish known as ‘alevins’. They have eyes the size of their heads, and enormous yolk sacs on their bellies to sustain them until their insect prey hatch later in the spring – providing that their hatch was timed correctly. Hindered by these yolk sacs, alevins are poor swimmers and vulnerable prey to hungry river fish and birds. The first year is often the hardest. The tiny fish must forage constantly and evade predators like trout, hungry birds, and even other juvenile salmon. If they survive the following winter to become parr, they will have to spend two more years of foraging and fighting for their lives before they become adults. Environmental threats like hot summer temperatures and frigid winter ones combined with pollution and low oxygen levels can kill more parr than predators can! By the time they’re teenagers, only 5% of their siblings will have survived. After several winters in the stream, a set of environmental cues will trigger a dramatic change. The parr, who have lived their entire life in freshwater, will begin to overhaul their physiology in preparation for a life in saltwater. They must change the way their gills filter water, the way they eliminate waste, and the way they camouflage themselves. Turning from brown to silver in colour, they are now called smolt, and they complete their transformation while migrating through a labyrinth of streams to the ocean. Along the way, they encounter new species of hungry fish, birds, and aggressive adult salmon headed upstream to spawn. Of the smolts who leave their freshwater homes, only half will complete their journey to the sea. When they reach the ocean, they gorge themselves on smaller fish and shrimp, doubling, tripling or even quadrupling in size in a matter of months. They follow their prey from Nova Scotia to Greenland, meeting up with comrades from Newfoundland, Ireland and Norway along the way. But all too often they aren’t the only ones gorging themselves – commercial fishermen follow the hordes of hungry fish, hauling enormous, fish-filled nets out of the water daily. Eventually, the surviving adults turn away from their feast and head back to their home streams. Females fat with eggs and males spoiling for a fight navigate through estuaries filled with pollution, rivers blocked by dams, and streams littered with avid fly fishermen. The few that make it to their destination dig gravel nests and lay the next generation of eggs. Spent adults drift back to the ocean to gorge themselves again – they may make this spawning journey several more times in the following years. Adapted from a column in The Brunswickan (published October 2015).